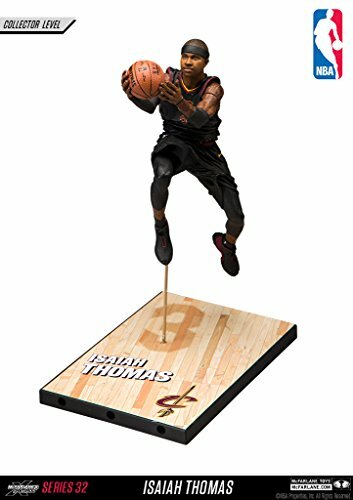 McFarlane Toys Nba Series 32 Isiah Thomas Cleveland Cavaliers Silver Level Black Uniform Collectible Action Figure - Limited to 750 pieces by McFarlane Limited Edition at Basket Express. MPN: nba_32_bthomas. Hurry! Limited time offer. Offer valid only while supplies last. Offseason addition to the Cleveland Cavaliers, Isiah Thomas will brought his talents to Believeland before being shipped to the Los Angeles Lakers. Offseason addition to the Cleveland Cavaliers, Isiah Thomas will brought his talents to Believeland before being shipped to the Los Angeles Lakers. Isiah Thomas looks to continue on the playoff success he had in Boston, if the Lakers make the playoffs again someday. Limited to 750 pieces made. If you have any questions about this product by McFarlane Limited Edition, contact us by completing and submitting the form below. If you are looking for a specif part number, please include it with your message.